More than 250 SDS/2 users, industry partners and Design Data representatives gathered for educational sessions, networking and a first-hand look at the future of the software at the 2015 SDS/2 Users Group Conference. 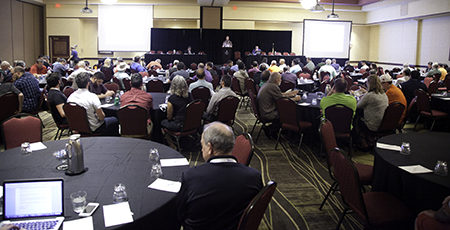 The three-day event was held September 16-18 at The Embassy Suites in downtown Lincoln, Nebraska. Following the welcome and opening remarks on Wednesday, Terry L. Salazar of Quilling, Selander, Lownds, Winslett & Moser, P.C. provided the conference's keynote speech, which focused on trends in contract documents and BIM. The discussion also covered proactive measures for pursuit or defense of claims, as well as key issues related to scheduling, loss of productivity impacts, and dispute resolution pitfalls. The annual Design Data update touched on the current status of SDS/2 v2015 as well as a few highlights of v2016, which is now an alpha release. The update also included highlights of Openmind ideas that were released (a snapshot of votes will be taken on October 30 for v2017). Wednesday also included the business meeting and a series of roundtables, which gave conference attendees the chance to have a voice in future development of the software. Roundtable topics included connections, custom members/components, templates, Drawing Editor and concrete. The day concluded with the opening of the Partner Pavilion, which hosted partnering companies and served as the venue for Wednesday evening's reception (sponsored by Peddinghaus). Click here to view images from the Partner Pavilion. The last two days of the conference were dedicated to breakout sessions, including those providing a first look at the new tools in v2016, such as stair enhancements, new and updated connections, 2D hatches, and processing on the fly. Other sessions focused on template detailing, modeling techniques, custom properties, little known Drawing Editor tools, model interaction with different disciplines, and v2015 parametrics. To view available presentations from the conference, click here. Design Data's annual Thursday night conference dinner was held at the Rococo Theatre in downtown Lincoln. 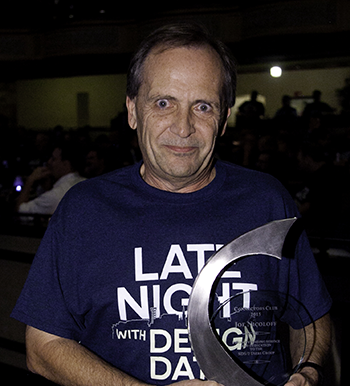 The theme for this year was Late Night with Design Data, a talk show hosted by Doug Evans. The night included a top ten list, nonsense karaoke, egg Russian roulette, kid interviews and a lip sync battle. Click here to view images from the Thursday night dinner. To view additional images from the conference, visit our Facebook page. Design Data is looking to feature customer projects in future issues of our newsletter! If you would like to see your project included, please send a project description and images to Michele Arnett. Winners of the 2015 SDS/2 Solid Steel Competition were announced during the Design Data Dinner and Reception at the SDS/2 Users Group Conference. To view an image gallery of this year's winners, visit our Facebook page. Mark Selvaggio of Selvaggio Steel and Luis Torres from The Steel Detailers, Inc. were among the presenters for the annual Connectors Club Award, given during the Design Data Dinner and Reception at the SDS/2 Users Group Conference.